Here’s part two of Bill Welch building two gondolas at once. Part one can be found here. In preparation for painting, I like to media blast models with Baking Soda to slightly roughen/etch the surface. A thorough soaking in Ivory Snow is next followed by a good rinse in clear water. I like to do this kind of work in batches of four to six models. Now I am almost ready to paint. I use some of the green florist wire F&C includes with their kits to make hangers using the truck screws to hold the wire. Holding each model by these hangers I sloshed on 91% Isopropyl Alcohol with a brush and scrubbed them to make sure no fingerprints survived. One of my trusty airbrushes was used to blow them dry. Image from the Bill Welch Collection. Missouri-Illinois 2146 builder image from the Joe Collias Collection. I used good photos of the blister-side gons to help with the placement of decals Although no photos of the StLB&M cars apparently exist, there is no reason to believe their scheme would have differed from the other identical cars. I used the very fine decal set from Speedwitch Media. I had no photos of the Union cars in-service but through the Internet I was able to connect with another modeler who knew a lot about the URR. He sent me a photo of his model representing a re-paint, which I used to guide my work. The F&C decals are not as sharp as the Speedwitch decals but they proved serviceable and once on the model they look good. They presented no application challenges. I like to have fun with my modeling, which in this case meant using different reporting marks on each side of the model. For the end reporting marks my thinking was that anyone looking at the side reporting marks it was likely they would see the reporting marks on the end that are closest to the side reporting marks. The Speedwitch decals are very thin but with care they go on easily. My routine is to create a puddle of Microscale’s “Micro Set” (blue label—the one with the smell of vinegar) and when that looks dry come back with “Micro Sol” (red label). The chalk mark decals on both models were once available from Sunshine Models. The photo shows my favorite decaling tools. The scissors were purchased from Champ Decals years ago and are joy to work with. The spring action makes them easy to control the cutting and I can trim very closely to the decals. They bear the name “Zephr” and are made in Pakistan. Supposedly they are intended for eye surgery but I have no way of verifying this. I Googled “zephr scissors” recently and found a vendor. 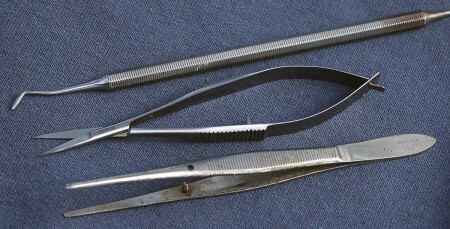 The dental tool is called a Hollenback. I came across it over twenty years ago when I asked my dentist in Tennessee if he had any broken tools I could have. I didn’t know what I was looking for exactly. I just figured he might have something I could use. I used the original one for 10-12 years before dropping it. I really panicked but my dentist in Virginia came through and gave me three, one of which was exactly right for me. The tweezers are sort of sentimental yet very utilitarian. My memory is that I acquired them when I was working on an insect collection for Jr. High Biology and I have used them ever since. They bear the imprint “Hamilton Bell Co. USA” and it looks like they are still in business. Their items are classed as Student Grade and with about twenty-three years in the classroom I like the synchronicity of still using tweezers intended for a student. Their ends are fairly wide and serrated, enabling a good grip on the decals without damaging them. After I was finished decaling, I gave the cars another gloss clear coat finish. Then I created a very thin wash using one part paint to nine parts of water and a couple of drops of Winsor & Newton’s “Flow Improver” to prevent water beading and sprayed this mix on both models very thinly. I like the way it helps blend the decals into the painted model. After the wash was applied, I came back with another gloss coat and applied the black decals pieces and then the white reweigh and lube data decals. I want these to look newer and fresher than the rest of the lettering. Questions and comments can be posted below. Please follow the instructions so your comment can be posted. All comments are reviewed and approved before they appear. I have the tools you suggest but I never thought of using the dental tool as you do. I will give it a try as It can be a pain fishing foe small decals with a brush.